Propane tanks come in several sizes. Choose one based upon your propane usage. Furnaces are one of the most popular ways to heat a home, and propane is a prime example of this heating method. But just like any other home heating system, a propane furnace is subjected to years of wear, which means that it may not be running optimally - not be the best start to the winter season! Dr. Energy Saver can help with all of your propane furnace repair and installation needs. We specialize in both "high-boy" and "low-boy" furnaces, depending on the space available to you. We can also install new propane furnaces that operate at 96% energy efficiency, meaning life-long energy savings for your home. If you're worried that your propane furnace isn't functioning as it should, Dr. Energy Saver can evaluate your current heating system and provide a free quote on repairs or a super-efficient furnace that will save you money. Call or contact your local dealer online today! If you're using propane to heat your home or are considering switching to propane, it's important to know a bit about it. Propane fuel is produced as a byproduct of natural gas and petroleum refining. About 90% of the propane consumed in the U.S. is also produced here. A propane furnace works much the same as a natural gas furnace, which is useful if you're switching from another kind of gas furnace. 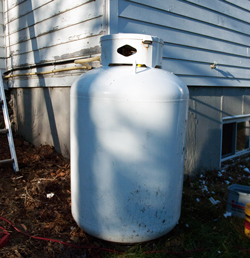 A home with a propane furnace will usually have propane fuel delivered to a large, permanently installed tank, meaning you won't have to worry about running out. It's easy to tell if you have an old-style propane furnace. It will have a flue pipe that's connected to a chimney. So-called "atmospheric" or "natural combustion" furnaces can perform reliably for years. But even when operating perfectly, their AFUE numbers probably won't get above 65% - 75%. Newer, sealed-combustion style furnaces, on the other hand, are super-efficient, earning AFUE ratings as high as 96%. If you're looking to save money, this can be an extremely effective option! A sealed-combustion furnace is so named because the combustion chamber is closed off in order to have more control over the combustion process. The air required for combustion is piped to the combustion chamber from outside the house, through a small-diameter plastic pipe. Gasses that result from combustion are also vented outside through a pipe, with assistance from a small fan. This type of furnace is sometimes called "direct vent" because it can be vented through an exterior wall. No chimney is necessary. If you're interested in installing a new propane furnace or need help maintaining your current model, your local Dr. Energy Saver dealer has the tools and techniques required for a job well done. Contact them today and get started on a warmer, more efficient home!